Please note that the seating capacities quoted are for "theatre style" layout and may be smaller depending on the layout you choose. When you book a room we will set it out according to your requirements. 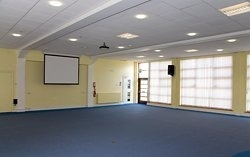 With a seated capacity of up to 150 people this room is ideal for presentations to large groups, public events, children's activities, exercise classes and more. The hall is on the ground floor and is fully carpeted. 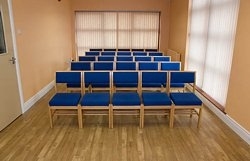 This slightly smaller hall will easily accommodate presentations to groups of up to 45 people and is ideal for classes or groups of more than 20 which require tables or some extra space. The Upper Main Hall is located on our first floor and is accessible by lift as well as stairs. 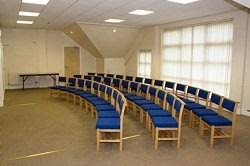 This cosy room with soft carpet and fireplace is great for meetings, classes or small presentations. 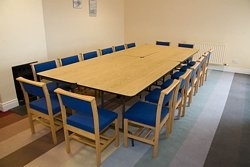 It will seat up to 25 people, but as with each room we can advise you of the capacity for your chosen layout. The first of three medium sized rooms on our first floor, this bright and airy room with wooden floor is ideal for informal meetings and small groups. It will seat up to 20 people. 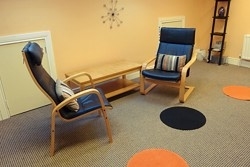 The Eaves is a private and comfortable space ideal for consultations, counselling or small groups of 8-10 people. It is equipped with two leather chairs and a coffee table, but additional chairs and a full-size table can set up instead.